The Golden Isles of Georgia boast year round temperate weather and lovely beaches makingÂ St Simons propertyÂ highly desirable. The barrier islands of St Simons Island and Sea Island provide a wide variety of sports and leisure activities for residents and visitors alike. 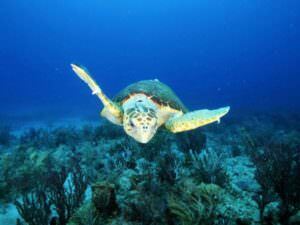 But for the Loggerhead turtle, they provide something even more important – a nesting area. There are only seven species of sea turtle roaming the world’s oceans today and most of them are considered endangered species. The Loggerhead turtle, so named because of its large head, is one of those endangered species that has long been nesting on the beaches of Georgia’s barrier islands. The Loggerhead turtle has a long life span of 47-67 years on average. They don’t reach sexual maturity until they are between 30 and 35 years of age, and reproduce only every two to three years. But not only do they have a low reproductive rate,only a tiny number of hatchling turtles ever make it past waiting predators to the sea alive. Add to those odds, the number of seat turtles that are killed or injured each year by fishing gear and you can easily see why they are listed as a threatened species. As a St Simons property owner you may come across a turtle nesting area along one of the beaches on any of Georgia’s barrier islands, keep your distance. Remember not to disturb a turtle that is nesting or crawling to or from the ocean. Be sure to report any stranded turtles to the Georgia Nongame-Endangered Wildlife Program. Since 2007, the Georgia Sea Turtle Center has been providing emergency care for injured and stranded sea turtles. They also Â sponsor exhibits and programs for the public which educate while offering a unique glimpse into the lives of these fascinating creatures.